It has been a busy few weeks at Brooklyn Bridge Park. 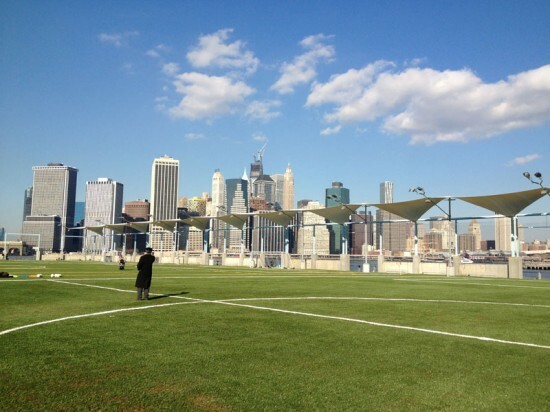 Last week, AN got a preview of the Squibb Pedestrian Bridge, which will be completed before the end of the year, and today, Mayor Bloomberg announced the opening of the new sports fields on Pier 5 and the nearby Picnic Peninsula, designed by Michael Van Valkenburgh Associates. 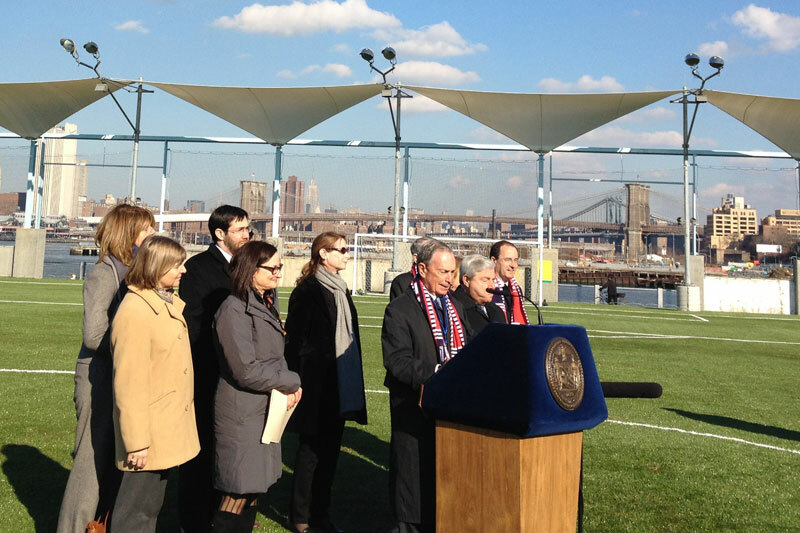 Regina Myer, the President of Brooklyn Bridge Park, told the crowd that they have been advocating for these recreation fields since the mid-1980s, which will now be used for a variety of field sports including soccer, lacrosse, rugby, flag football, and cricket. 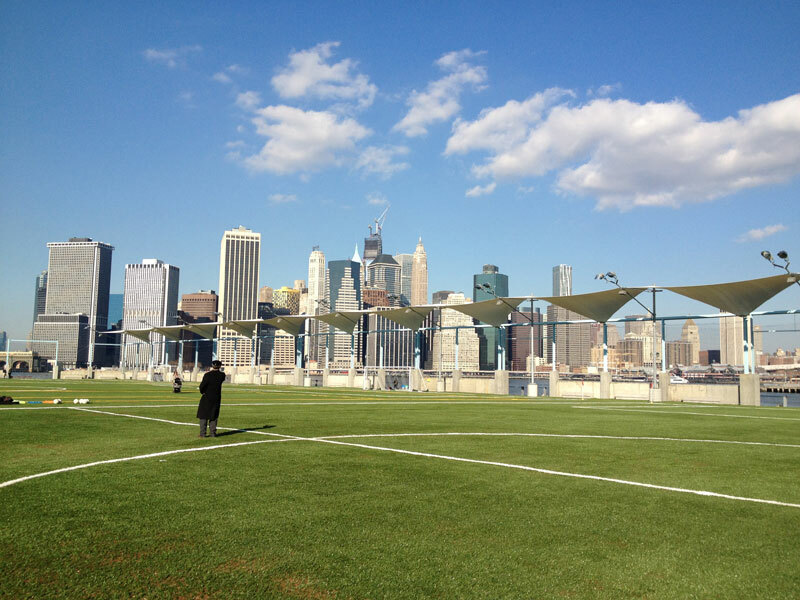 This $26 million project spans 5-acres and offers turf fields supported by shock pad and organic infill made of sand and coconut fibers, shade sails on the northern and southern sides of the pier, and lighting for evening games. In addition to field recreation, there will be an area reserved for fishing with bait and preparation tables provided and a 30-foot promenade on the periphery of the field. While Mayor Bloomberg said that “Pier 5 is designed to withstand sever weather events,” it didn’t make it through Hurricane Sandy unscathed. According to the press release, the electrical equipment “sustained significant flood damage during Hurricane Sandy,” and evening play will be postponed until the equipment can be replaced. The Picnic Peninsula, next to Pier 5, will offer a barbeque area outfitted with picnic tables made from salvaged long-leaf yellow pines, umbrellas, grills (to accommodate more than two dozen grills), a concession area, and a tetherball court. 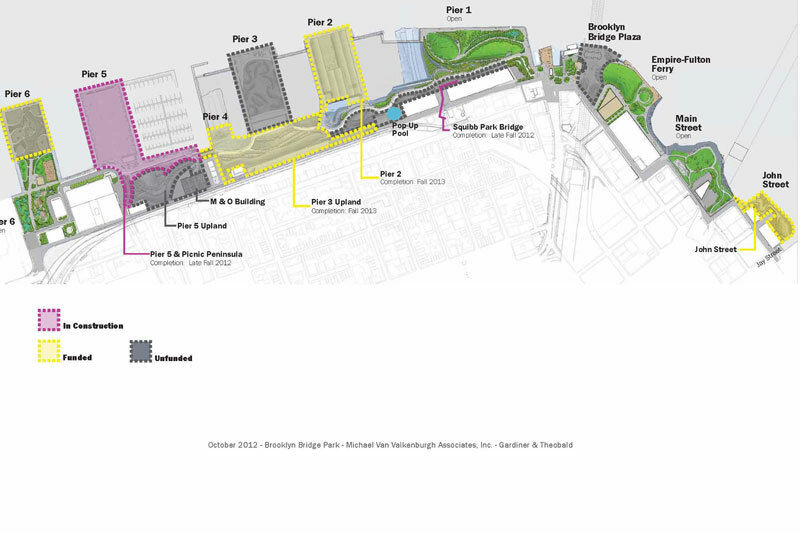 The last three unfinished piers planned for recreation space are wedged in the middle of Brooklyn Bridge Park, and are slated for completion in Fall 2013. The 5-acre Pier 2 will be reserved for basketball, handball, and bocce, in addition to a skating rink and swings. Pier 4 will offer an area for non-motorized boating and an upland park. Pier 3, however, is the only unfunded slice of the park, but the plans for it include a “reprieve” said Paul Seck, Associate Principal at Michael Van Valkenburgh Landscape Architects, with lawn areas and an esplanade.